Opera’s built-in ad blocker is an opt-in feature that helps web pages load faster by blocking ads. It also stops harmful tracking cookies and cryptocurrency mining scripts. Before using Opera’s built-in ad blocker, the feature must be enabled in the browser. Open Opera, and go to Settings. Under Block ads, click the switch. The ad blocker is now enabled. You can find the ad blocker badge in the right side of the combined address and search bar. The blue ad blocker badge shows that the feature is enabled. The badge has no color when ad blocker is disabled. Click the ad blocker icon to open the ad blocker pop-up window. 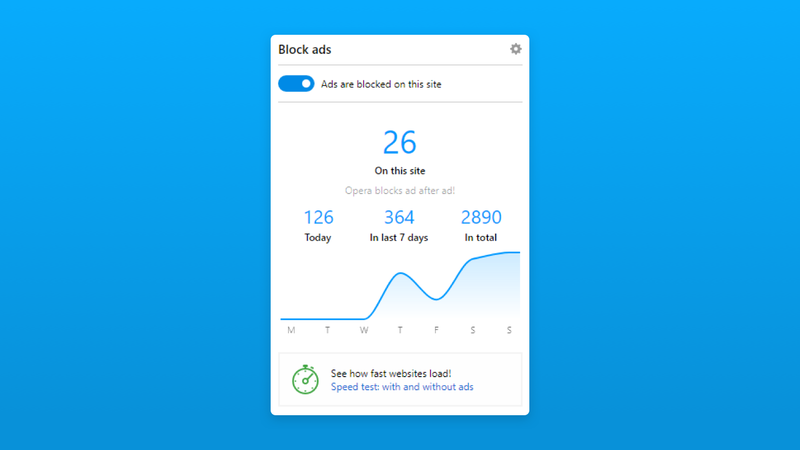 In this window, you can turn off ad blocker, see how many ads are blocked on the currently open web page or in your browsing history, a link to the speed test, and a link to the settings page for ad blocker. How do I whitelist a website with Opera’s ad blocker? Some websites request for you to disable the ad blocker so you can visit and fully enjoy their web pages. Instead of having to completely turn off Opera’s ad blocker to visit one site, you can whitelist the requesting website. To whitelist a website, you can turn off ad blocking for that site. To do this, open the ad blocker pop-up window in the combined address and search bar and click the switch. 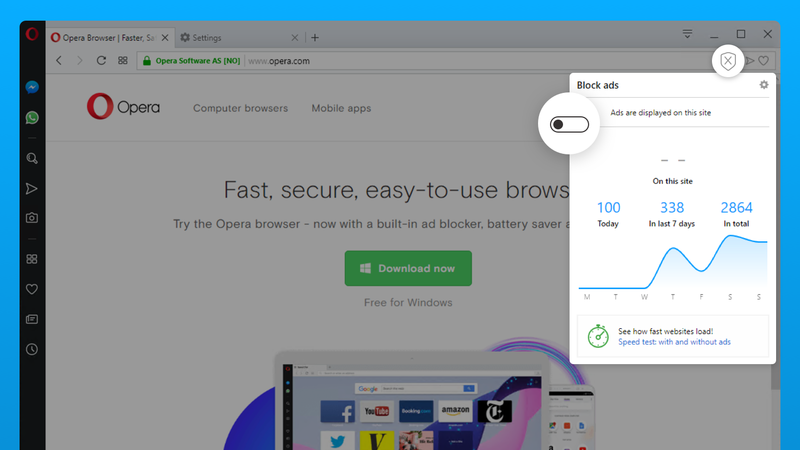 Opera’s ad blocker pauses when you visit a whitelisted website and resumes when you navigate to another website, allowing for an uninterrupted browsing experience. The whitelisted website’s domain is added to your ad blocking exceptions list. Read below to learn how to manage exceptions for Opera’s ad blocker. You can choose which filter lists Opera’s ad blocker will use when the feature is enabled. EasyList and NoCoin are enabled by default. Check the boxes next to the lists you want enabled for ad blocker. 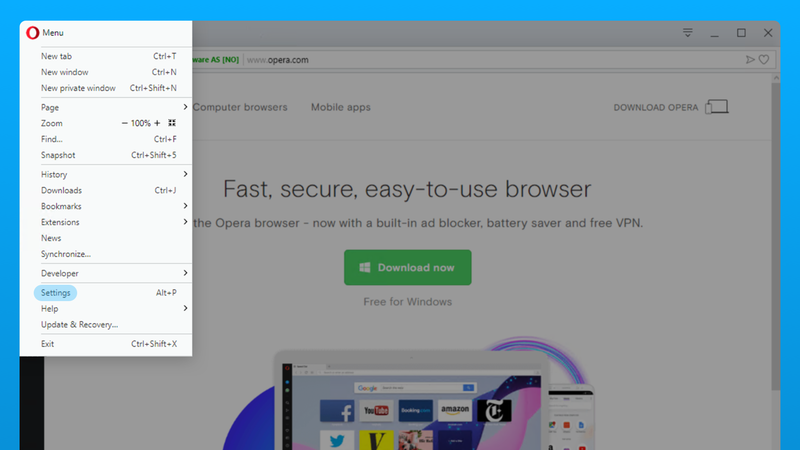 Opera updates your selected lists automatically. You can update the lists manually by clicking the Update button at the top of the page. What are the “lists” for Opera’s ad blocker? Lists, also known as filter lists, contain rules that tell ad blockers which content is likely to be an ad. The most popular and commonly used list for removing ads on international websites is EasyList. 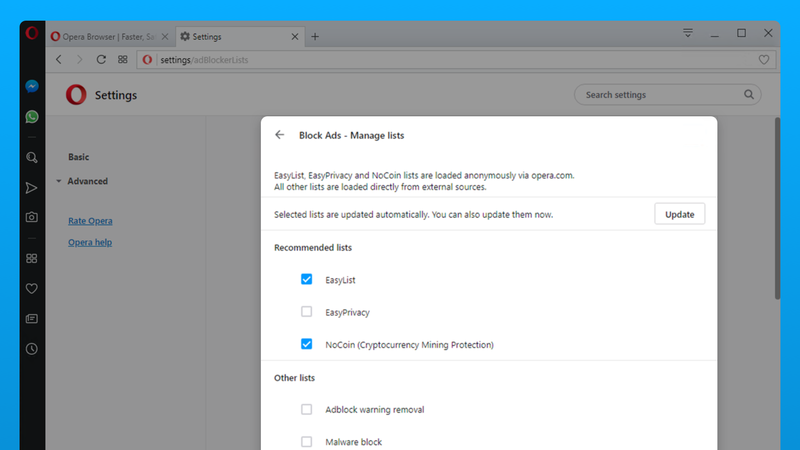 Opera includes additional lists, such as EasyPrivacy, NoCoin, and lists according to multiple languages. NoCoin is a cryptocurrency mining protection filter list which stop crytpojacking scripts from running on your computer. Click here to read more about Opera’s cryptocurrency mining protection.